The impact of any child's most influential years becomes strongly magnified when growing up in the wake of a disaster as historically significant as Hurricane Katrina. Although Big Brothers Big Sisters of Southeast Louisiana can easily be counted among those victimized by Hurricane Katrina—suffering the loss of their center of operations with the flooding of their offices and the dismantlement of their staff—the organization has never relented in its commitment to serving the youth and families of communities in New Orleans and the surrounding area. Before Katrina, Big Brothers Big Sisters of Southeast Louisiana was part of the national Big Brothers Big Sisters network dedicated to provide mentoring services to youth and teenagers in need of guidance from a positive role model with whom they could identify. The organization suffered the loss of its offices due to the flooding that resulted from Katrina and remained without a center of operations until November of 2006 when they resumed at their new location on Canal Street in Downtown New Orleans. While rebuilding their staff after Hurricane Katrina, Big Brothers Big Sisters of Southeast Louisiana has been working tirelessly to expand its efforts to specifically target the needs of communities most severely affected by the storm. Though there remains a long road ahead, the progress that has been made in the recovery of the citizens and communities of the city of New Orleans would not have been possible without the dedicated efforts of individuals and charitable organizations. Likewise, the ability of Big Brothers Big Sisters of Southeast Louisiana to rebuild its organization and meet the needs of communities devastated by the storm depends on the support and dedication of willing and passionate individuals. 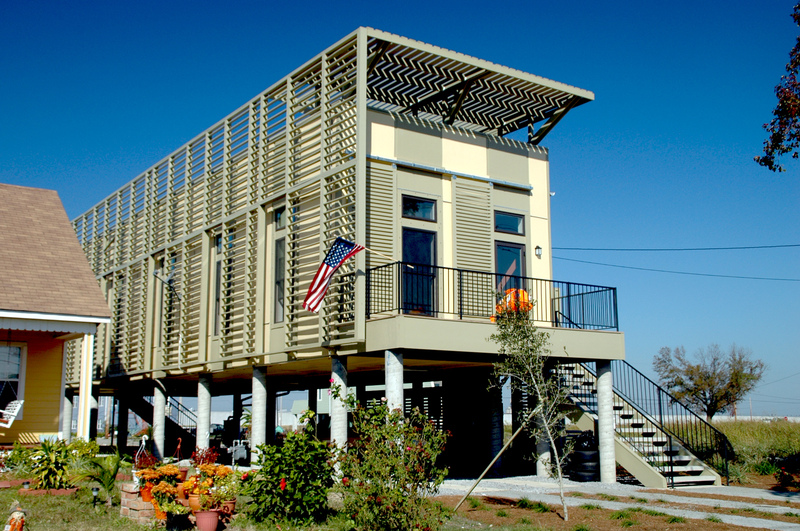 Make It Right Foundation works to build affordable and environmentally sustainable housing in the aftermath of Hurricane Katrina for residents of the Lower Ninth Ward in New Orleans. In the Lower Ninth Ward of New Orleans, the nonprofit disaster recovery organization Make It Right is working to bring home residents of the community hardest hit by Hurricane Katrina. Prior to Katrina, the Lower Ninth Ward was a neighborhood within the city of New Orleans rich in culture, civil rights history, and home to jazz musicians such as Fats Domino and Kermit Ruffins. The Lower Ninth Ward—which included a 98.3 percent black demographic—was also one of the city’s poorest districts, with 36.4 percent of the population living below the poverty line; 8.5 percent greater than the overall average of Orleans Parish. According to Make It Right, 4,000 homes were destroyed in the Lower Ninth Ward as a result of Katrina. The death toll within the neighborhood accounted for half of all Katrina related deaths in the state of Louisiana as a consequence. Because the infrastructure of the neighborhood was all but entirely destroyed and because most residents lacked the resources to return to their homes, the Lower Ninth Ward remained largely abandoned for several years following Katrina. Until the emergence of large-scale rebuilding campaigns such as Make It Right, proposals of razing the remains of the neighborhood were seriously considered as an option within the civic sphere. On December 3, 2007, Make It Right and organization founder Brad Pitt started a campaign to build 150 new affordable and environmentally sustainable houses, with the oversight of professional architects, in the Katrina-devastated Lower Ninth Ward for residents who otherwise lacked the means to return. In the years since, there have been several dozen new homes constructed in the neighborhood as well as hundreds repaired to living standards with the help of additional nonprofit efforts. In addition to building homes, Make It Right helping to restore the community with new micro-farms, roads and native landscaping. You can get involved in the efforts of Make It Right to restore the lives of residents and the community of the Lower Ninth Ward in the aftermath of Katrina with a tax-deductible cash donation through the Make It Right website, or simply text “SAINTS” to 25383 to make a donation of $10 applied to your wireless bill. Project Fleur-de-lis has been one of the few nonprofit organizations in the New Orleans area that has provided mental health services to those suffering psychological trauma in the wake of Katrina. 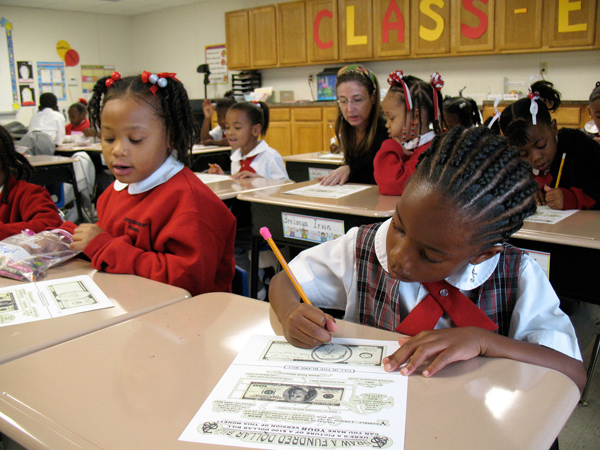 Despite the general scarcity of resources in the city of New Orleans to address the mental health crisis following Hurricane Katrina, Project Fleur-de-lis has taken strong initiative in helping children and families affected by traumatic experiences develop ways to cope with the psychological scars that resulted from the disaster. Project Fleur-de-lis seeks to take a proactive approach to address the severity of the mental health crisis in New Orleans following Hurricane Katrina though intervention in the influential stages of childhood development among children suffering psychological trauma. It has been well-documented that in the wake of Katrina, severe mental illness among survivors of the disaster, as well as those suffering from its after-effects in the city of New Orleans has reached a rate double that of the general population. Project Fleur-de-lis is a nonprofit organization which utilizes a three-tier intervention system designed to identify individuals in need of mental health services after suffering psychological trauma incurred in the wake of Hurricane Katrina and to curb the damaging effects of the enduring symptoms on a child’s future academic and social development. Project Fleur-de-lis works with more than 60 participating elementary schools in the area of New Orleans to provide in-school services to those in need of assistance. Beginning with school-wide interventions, Project Fleur-de-lis attempts to identify and reach out to those in need of mental health services to address the psychological trauma of Hurricane Katrina and its after-effects through classroom intervention and in-school counseling. For those requiring further assistance, Project Fleur-de-lis offers assessment and referral services from professional counselors to additional professional mental health services and care. Project Fleur-de-lis additionally offers educational workshops for parents and teachers to help develop approaches to more effectively cope, as well as assistance to those in financial difficulty to provide a healthy environment for psychological healing. 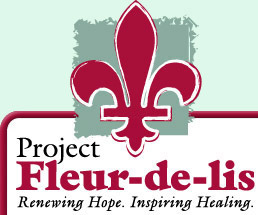 You can help support Project Fleur-de-lis in its efforts to provide mental health care for those suffering the psychological scars of Hurricane Katrina with a donation by telephone or contact the Project Fleur-de-lis Director of Development Stephen J. Engro at the Project Fleur-de-lis website. 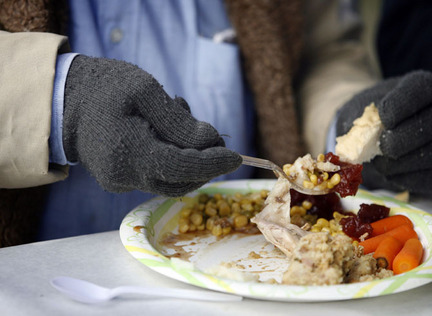 Bridge House of New Orleans provided free meals for homeless citizens in New Orleans on Christmas Day, 2009. As with many institutions and organizations serving the public of New Orleans, Bridge House of New Orleans was faced with a critical situation in which none could afford to consider any failure to step up to meet the needs of the population in the wake of the devastation that followed Katrina. A situation already plagued by a lack of healthcare access for those without the financial had become one of dire need due to a lack of available providers in the area following the flooding and displacement those who occupied homes, businesses and public service institutions. The lack of such services in health care, particularly for that in areas such as mental health and substance abuse could hardly have come at a worse time, as many found such services absent in the greatest time of need. Despite the difficulties of the situation following Katrina, Bridge House of New Orleans has remained a reliable resource to those seeking treatment for drug and alcohol addictions. In the fall of 2006, Bridge House—which had previously offered treatment exclusively for men—merged with the only female-exclusive substance abuse rehabilitation center for women, Grace House, and effectively began its expansion of treatment services across gender lines. Bridge House of New Orleans not only works to assist those seeking treatment for addiction to simply kick the substance addiction itself, but continues to work with patients who have worked their way through the chemical addiction to build valuable life skills and job skills within a structured environment. Helping those recovering from a lifestyle of addiction to build a healthy, structured routine not only helps patients regain a sense of self-worth, but has proven highly effective at a rate of 70 percent for those who complete the full program. Bridge House of New Orleans accepts donations on their website through PayPal or through credit card, cash or check. Bridge House of New Orleans also accepts donations of furniture, clothes and other usable household items to the Bridge House Thrift Stores, as well as tax-deductible used car donations. 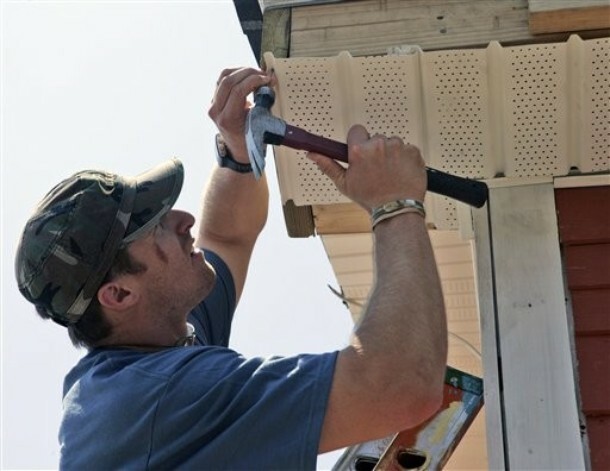 New Orleans Saints quarterback Drew Brees helps install siding on a home for a Habitat for Humanity build. New Orleans Area Habitat for Humanity has provided an invaluable service in the recovery effort and around the city of New Orleans following the devastation in the wake of Hurricane Katrina. With the support of 18,000 volunteers and more than 301,000 volunteer hours worked the organization has built 93 new homes in New Orleans and in the neighboring Parishes of Jefferson and St. Bernard in the past year alone. Since the Katrina recovery effort began, New Orleans Area Habitat for Humanity has helped 278 families in the area become new homeowners. A major recent success of New Orleans Area Habitat for Humanity since Hurricane Katrina has been the construction of Musicians Village in the Upper Ninth Ward of New Orleans. The project reached its successful completion in September of 2009 with the construction of 72 new homes. The founders of the Musicians Village project—Harry Connick Jr., Branford Marsalis, Ann Marie Wilkins and Jim Pate—are scheduled to be honored on May 11, 2010 at the National Building Museum in Washington for their efforts. New Orleans Area Habitat for Humanity has received volunteer support from a number of other highly notable names; among them, New Orleans Saints quarterback Drew Brees, who additionally runs his own charity—the BreesDream foundation—to support cancer research and care and provide opportunities and education for disadvantaged youth. New Orleans Saints players Chris Reis, Usama Young and Tim Duckworth have also recently worked in partnership with New Orleans Area Habitat for Humanity in the Katrina recovery effort. The volunteer base of New Orleans Area Habitat for Humanity ranges widely from athletes and celebrities to students and ordinary individuals who wish to become involved and be a part of the effort to restore communities and improve the lives and opportunities of individuals within. You can get involved in the Katrina recovery effort with a donation or sign up to volunteer for a build at New Orleans Area Habitat for Humanity’s website, or sign up to volunteer at your local Habitat for Humanity affiliate. The St. Bernard Project has been a primary driving force in the recovery of St. Bernard Parish, Louisiana following Hurricane Katrina. The St. Bernard Project has played a vital role in the recovery of St. Bernard Parish, which was all but entirely destroyed as a result of Hurricane Katrina. St. Bernard Parish—which borders Orleans Parish and New Orleans‘s devastated Lower Ninth Ward—was once home to an ethnically diverse, hard-working blue collar community home to 67,000 residents. In the wake of Katrina, all 27,000 homes were rendered uninhabitable and 14,000 businesses were lost, leaving all survivors within the community displaced. In March of 2006, Liz McCartney and Zack Rosenburg founded the St. Bernard Project, an independent non-profit organization with the goal of restoring the community in St. Bernard Parish in the Greater New Orleans area by rebuilding homes for families displaced by Katrina. The rebuilding program, supported entirely by volunteer labor under the direction of skilled supervisors and charitable funding for building supplies, provides assistance to financially burdened families including the elderly and disabled, as well as families with small children. With the help of over 18,000 volunteers, 262 rebuilding projects have been completed, allowing families in the Greater New Orleans area previously living in cramped FEMA trailers or displaced elsewhere by Katrina to move back into their homes, with 50 more projects currently in progress. 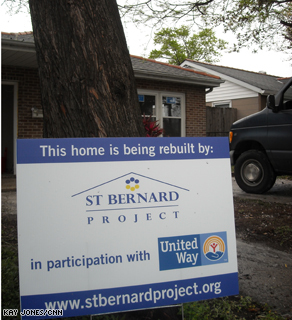 In January of 2009, the St. Bernard Project began an additional program, the Community Wellness and Mental Health Center at the office of the St. Bernard Project, offering services to both groups and individuals in the Greater New Orleans area to provide necessary aid to the psychological as well as well as the physical rebuilding process in the wake of Katrina. There are a number of ways by which you can get involved and be a part of the rebuilding process of the lives of those affected by Hurricane Katrina and the community of St. Bernard Parish in the Greater New Orleans area. You can volunteer for a build project or make a tax-deductible donation through the St. Bernard Project website. You can also help by hosting a fundraiser or by simply spreading awareness through the St. Bernard Project Fan Page on Facebook, through which fundraising is also possible as well as simple to do.